Angelini, P.; Binucci, C.; Evans, W.; Hurtado, F.; Liotta, G.; Mchedlidze, T.; Meijer, H.; Okamoto, Y. 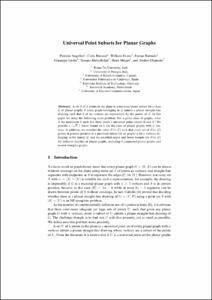 A set S of k points in the plane is a universal point subset for a class G of planar graphs if every graph belonging to G admits a planar straight-line drawing such that k of its vertices are represented by the points of S . In this paper we study the following main problem: For a given class of graphs, what is the maximum k such that there exists a universal point subset of size k ? We provide a ⌈ √ n ⌉ lower bound on k for the class of planar graphs with n ver- tices. In addition, we consider the value F ( n; G ) such that every set of F ( n; G ) points in general position is a universal subset for all graphs with n vertices be- longing to the family G , and we establish upper and lower bounds for F ( n; G ) for different families of planar graphs, including 4-connected planar graphs and nested-triangles graphs. Angelini, P. [et al.]. Universal point subsets for planar graphs. A: International Symposium on Algorithms and Computation. "Lecture Notes in Computer Science". Taipei: Springer, 2012, p. 423-432.